He has experience in managing technology teams in large companies and startups, having previously served as Head of Engineering of the Security Solutions Module, Teckler.com CTO, Match Latam CTO, and Head of Engineering and Technical Operations of Automatos. He is a mentor to 21212 and Endeavor covering the areas of product and technology management, as well as aspects related to high performance culture, staffing and team development. In Module Security Systems he was responsible for the development of the global platform of GRC – Risk Manager and C2 – Command and Control Manager, managing several professionals among software engineers (front-end, backend and mobile), Information Designers and Architects and, QA professionals and, QA professionals. 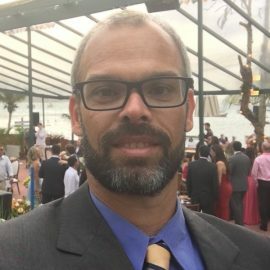 He was a founding partner and CTO of Teckler.com (Brazilian startup, launched in the United States and Brazil), where he was responsible for all technical operations, architecture and project management of the Portal, as well as responsible for the definition and monitoring of business metrics and product. At Match Latam he was responsible for the development of the portal platform used by all users in Latin America. At Automatos.com, he was responsible for all technical operations and projects in the United States, Asia / Pacific, Latin America and India. He also served as Global Project Manager at Bowne Global Solutions (acquired by Lionbridge) where he was responsible for internet projects and portals with global scope. At the beginning of his career, he participated in the initial stages of 2 startups (Choice Technologies and Digital Factory), acting in various technical and managerial positions. He was partner and PMO of the Recruitment Safari – startup of recruitment and selection, having recruited for several technical positions. He is a Computer Engineer graduated from PUC-Rio, with specialization in Project Management by FGV and specialization in Data Science offered by Johns Hopkins University (via Coursera). He is Product Owner and Scrum Master (CSPO and CSM) certified by the Scrum Alliance, and PMI-certified project manager (PMP).